Ocean Best's Tuna Flakes are perfect for a scrumptious salad, sandwich, and even goes with pasta! 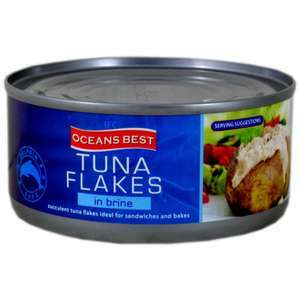 Our 170g tin contains brine so your tuna flakes will be marinated enough to become deliciously tender when you open it up! Great for stocking up the food cupboard! Tuna flakes are disgusting pay more get chunks ! The turkey twizzlers of tuna! And ruin it's kidneys because of the high protein content. Same here! Even the dog would not touch it! I returned them andanageed to get my money back. A pound is a pound! These are foul. I thought the tin I opened had gone bad but all 3 tins were terrible. All went in the bin. I agree, bought a couple of tins when on offer before. Ended up chucking 3 tins they were that bad! Just tuna scraps in water, disgusting,do yourselves a favour buy the better stuff. Just tuna scraps in water, disgusting,do yourselves a favour buy the …Just tuna scraps in water, disgusting,do yourselves a favour buy the better stuff. Tuna fish is like tea bags and ketchup......you can't buy cheap! As an occasional treat maybe, but too much tuna can leave them malnourished - it doesn’t have the nutrients they really need, like taurine, and can also give them mercury poisoning (and can humansfor that matter if you’re eating multiple tins a day), not to mention the massive amount of salt if the tuna’s in brine, as this is. Just fair warning to any cat owners thinking of economising!